Potato starch has been produced in Denmark on an industrial scale since 1900. 75% of the potato crop is grown for industrial processing and the Danes produce per capita more starch than any other nation. Starch constitutes the nutritive reserves of many plants. During the growing season, the green leaves collect energy from the sun. In potatoes this energy is transported as a sugar solution down to the tubers, and it is down there that the sugar is converted to starch in the form of tiny granules occupying most of the cell interior. The conversion of sugar to starch takes place by means of enzymes. Then next spring, enzymes are also responsible for the re-conversion of starch to sugar - transported upwards as energy for the growing plant. THE BASIS FOR STARCH QUALITY IS LAID IN THE POTATO CLAMP. In the field or stored in clamps during winter, the tubers stay alive and need some air for respiration and life activity. Potatoes consume a small amount of their own starch during winter to maintain life functions until spring. This requires fresh air and the respiration causes generation of heat. If the surrounding temperature falls with a risk of frost, the tubers try to save their skin by extensive conversion of starch to sugar in order to lower the freezing point in the cell juice. If this does not suffice, the tubers die. Potatoes therefore must be adequately covered when stored. If the potatoes get warm, respiration increases, raising the temperature further. A lot of starch is used for the respiration and the tubers will die of heat. Unfavourable storage conditions cause starch losses and, in the worst case, dead and smashed potatoes, which are disruptive for the process. Supplies of bad potatoes have to be rejected. Damage during transport also causes quality problems. Every single blow damages cells, with starch losses and a dead spot on the tuber as a result. It is therefore of utmost importance to handle the potatoes during transport as carefully as possible with the techniques and equipment available. REFINING BEGINS ALREADY DURING RAW MATERIAL INTAKE. Drop damper for initial filling of empty store. During unloading at the factory, damage can be reduced by covering buffer silos with rubber and minimising drop impact with rubber curtains. Smashed potatoes loose a lot of juice, causing foam and unnecessary problems in the washing station. Loose dirt, sand and gravel are removed on a rotating screen before the potatoes are deposited in the store - the better the dirt removal, the lesser the problems with stones and sand in the fluming channels later. The soil also contains considerable quantities of nutrients, which will dissolve in the washing water and contribute to the environmental effect caused by the effluent. The potato store is a necessity to secure the supply of potatoes overnight. Supplies for the weekend may also be required because of restrictions on heavy road transport outside ordinary working hours. The ideal situation is to reach the bottom of the potato store every morning, because the potatoes suffer during long storage in thick layers without adequate ventilation. EFFICIENT WASHING MAKES REFINING EASIER. Soil and dirt not removed in the washing station give problems later. The washing is therefore very important. The washing is a counter current process, with fresh water added through pressure nozzles in the final step. The potatoes are flumed by water in channels - passing a stone trap - to the washing station. The stone trap utilises the difference in specific weights between stones and potatoes - an upstream water flow carries the potatoes over the stone trap, while the heavier stones are trapped and collected on a stone conveyor. The water level in the washing drum has to be kept low so that the potatoes do not float. The drum is not merely a conveyor, but also ensures that the potatoes rub vigorously against each other. The rubbing is essential for the removal of fungi, rotten spots, skin and dirt from the surface. The floating water may be recycled after settling of sand in pools. A high standard of washing improves refining because many impurities resemble starch in specific density and size, so washing the potatoes is the only way to get rid of them. The quantity of impurities adhering to the potatoes on delivery depends to a great extent on weather conditions and on the soil where the potatoes are cultivated. The quantity of water used for fluming and washing is identical with the quantity of clean water applied in the final high-pressure spray. Rasping is the first step in the starch extraction. The goal is to open the tuber cells and release the starch granules. The slurry obtained can be considered as a mixture of pulp (cell walls), fruit juice and starch. With modern high-speed raspers, rasping is a one-pass operation only. The cell juice is rich in sugar and protein. 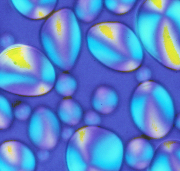 When opening the cells the juice is instantly exposed to air and reacts with the oxygen, forming coloured components, which may adhere to the starch. Powerful washing is needed to flush the starch granules out from the cells - the cells are torn apart in the rasper and form a filtering mat that tries to retain the starch. 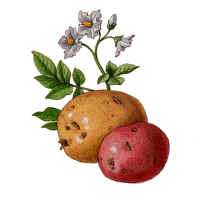 Water has previously been used for the extraction, but today extraction takes place in closed systems allowing the use of the potato juice itself. It has the advantage that the juice can later be recovered in concentrated and undiluted form, reducing transport costs for its use as a fertiliser. The flushed-out starch discharges from the extraction sieves along with the fruit juice, and the cell walls (pulp) are pumped to the pulp dewatering sieves. The pulp leaves the dewatering sieves as drip- dry - i.e. approximately 8% dry matter. The extraction takes place on rotating conical sieves, where centrifugal power increases the capacity per unit of area. The high efficiency makes it feasible to utilise high quality sieve plates made of stainless steel, which will withstand abrasion and CIP-chemicals. The sieve plates have long perforations only 125 microns across. Operating Principle of a Starch Extractor. The extraction is a counter current process in which the pulp-dewatering screen is actually the last step. If the pulp is required in almost dry form, the number of spray nozzles with washing water is reduced. Instead continuous back spraying is maintained to ensure that the dry pulp will slide down the screen. CONCENTRATING THE CRUDE STARCH SLURRY. On hydrocyclone unit as much juice is excreted as possible. The starch leaves the concentrator as pumpable slurry of approximately 19 oBe. The concentrating stage typically consists of a unit with hydrocyclone blocks for defoaming, concentrating and starch recovering arranged in series. It now remains to purify the crude starch milk (suspension) and remove residual fruit juice and impurities. The way it is done is more or less based on the same principles used when removing soap water from the laundry - you wring and soak in clean water again and again. Everyone doing laundry realises how often it is necessary to wring before the rinsing water is completely clear and that the harder you wring the fewer rinsing steps are required. In the same way, the starch slurry is diluted and concentrated again and again. To save rinsing water the wash is done counter currently - i.e. the incoming fresh water is used on the very last step and the overflow is recycled for dilution on the previous step and so on. In the strong gravitational fields of a hydrocyclone and a centrifuge, starch settle quickly, while fibres (pulp residuals) just float in the water. The juice is directly diluted in the water and goes with the water phase. By creating a water flow moving towards the starch, lots of fibres just floating in the water may be forced into the overflow. Soil, sand and many fungi etc. are of equal density or heavier than starch and it is not possible to separate these particles from starch by centrifugal force - that is why it is so important to remove as many impurities as possible from the potato surface in the washing station. Although some impurities go with the starch in the underflow, there is - by means of a sieve - a last chance to remove the larger particles - that is particles larger than 125 microns. The particles are not spherical. On the contrary, they are of irregular shape and may be forced through refining sieve, if the spray pressure is too high. Impurities not removed this way are not removable by any known technique. In the recovery steps all starch has to be retained in the underflow so only very little is wasted in the effluent (fruit water). The lower the water consumption, the more pumps are involved in the process and the more heat is generated. To retard bacterial growth refrigerator temperatures are ideal. In the effluent of concentrated fruit juice, cooling during extraction is a must because in hot juice microbes that break down protein and a bad smell may take control. CIP - CLEANING IN PLACE. The moist starch from the rotating vacuum filters is dried in a flash dryer with moderate hot air. The air is indirectly heated. Before delivery the starch is sifted on a fine sieve in order to remove any scale formed in screw conveyors etc. Starch finds uses in fast food, sweets, sausages, tablets, and paper, corrugated board etc. and plays a prominent part in our everyday life. By applying different reaction conditions - temperature, pH, additives - and strict process control speciality products with unique properties are made. These speciality products are named modified starches, because they still retain their original granule form and thereby resemble the native (unmodified) starch in appearance. But the modification has introduced improved qualities in the starch when cooked. The paste may have obtained improved clarity, viscosity, film-forming ability etc. Determination of starch content in potatoes. The starch content of fresh potatoes is correlated with potato density. A sample of 5050 g potato in a net basket is weighed above water and then again immersed in clean water of maximum 18 oC. 1) Weight of potato sample above water. 2) Weight of sample immersed in water. 3) Calculated density = (Wo / (Wo -Wu)). 4) Starch content according to the official table. 6) The minimum price to be paid by the manufacturer directly to the farmer in order to qualify for a subsidy. 7) An EU-subsidy I- a production premium - is paid to the manufacturer, if he pays the EU-minimum price or better. 8) A subsidy II- an equalisation payment - is paid directly to the factory, if he pays the EU-minimum price or better. The exchange rate 1. July 1996 was 1 ECU = 1,24 US$. This empirical method is used to settle accounts with suppliers of potatoes to starch factories. Similar method is used for cassava. Unfavourable storage conditions however may cause enzymatically conversion of starch to glucose affecting starch yield without changing the under-water-weight and density of potatoes. Therefore the method only apply to fresh potatoes. The method is by no means scientifically correct. Reliable methods for the determination of carbohydrates in potatoes exist, but the soluble non-starch fraction and the fraction of particular starch grains are indistinguishable from one another by practical accurate means.